Situated on the waterfront, this spa hotel is 1.1 mi (1.7 km) from Tanjong Beach and within 3 mi (5 km) of Universal Studios Singapore™ and S.E.A. Aquarium. Palawan Beach and Madame Tussauds are also within 3 mi (5 km). This hotel features 2 restaurants, a marina, and a full-service spa. Free WiFi in public areas, free self parking, and a free area shuttle are also provided. Additionally, an outdoor pool, 2 bars/lounges, and a fitness center are onsite. All 26 rooms feature thoughtful touches like bathrobes and slippers, plus free WiFi and LCD TVs with cable channels. Guests will also find DVD players, room service, and coffee makers. In addition to a full-service spa, ONE15 Marina Sentosa Cove Singapore features a marina and an outdoor tennis court. Dining is available at one of the hotel's 2 restaurants and guests can grab coffee at the coffee shop/café. Guests can unwind with a drink at one of the hotel's bars, which include 2 bars/lounges and a poolside bar. Wireless Internet access is complimentary. This Singapore hotel also offers an outdoor pool, a children's pool, and a fitness center. Guests can use the health club at a partner property. For a surcharge, a roundtrip airport shuttle (available 24 hours) is offered to guests. Limited complimentary onsite parking is available on a first-come, first-served basis. 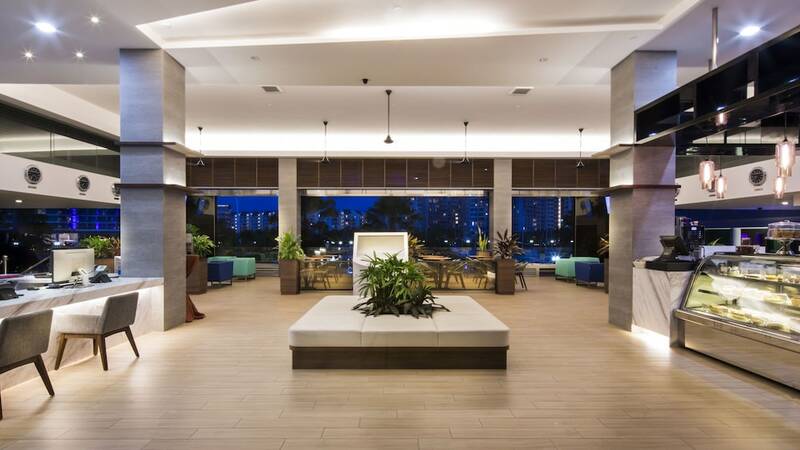 ONE15 Marina Sentosa Cove Singapore has designated areas for smoking. Local cuisine breakfasts are available for a surcharge and are served each morning. Latitude Bistro - This restaurant specializes in Asian cuisine. Guests can enjoy alfresco dining (weather permitting). Open daily. Crystal Jade Premium - This restaurant specializes in Chinese cuisine and serves lunch and dinner. Bar Nebula - This bar overlooks the pool. Boaters' Bar - Onsite bar. Guests can enjoy alfresco dining (weather permitting). Open select days. Pool Bar - Onsite bar. Open daily. An outdoor tennis court and a marina are featured at the hotel. An outdoor pool and a children's pool are on site. Other recreational amenities include a steam room and a fitness center. Guests can indulge in a pampering treatment at the hotel's full-service spa, Marina Sanctuary Spa. Services include facials and body treatments. The spa is equipped with a steam room. Reservations are required for spa treatments. Reservations can be made by contacting the hotel prior to arrival, using the contact information on the booking confirmation. Only registered guests are allowed in the guestrooms. The property has connecting/adjoining rooms, which are subject to availability and can be requested by contacting the property using the number on the booking confirmation. No pets and no service animals are allowed at this property. Parking height restrictions apply.